I love the function of dry erase boards; they're such great places to write notes to myself. (And they're fun to write on!) But I'm not always crazy about the boring, shiny white board. Well, I came across this nifty diy project on How About Orange. All you need to do is pick out a pretty piece of patterned paper or fabric, frame it under glass in a pretty frame, and hang it up on your wall or set it on your desk. (This is soooo simple... why didn't I think of it before?!) 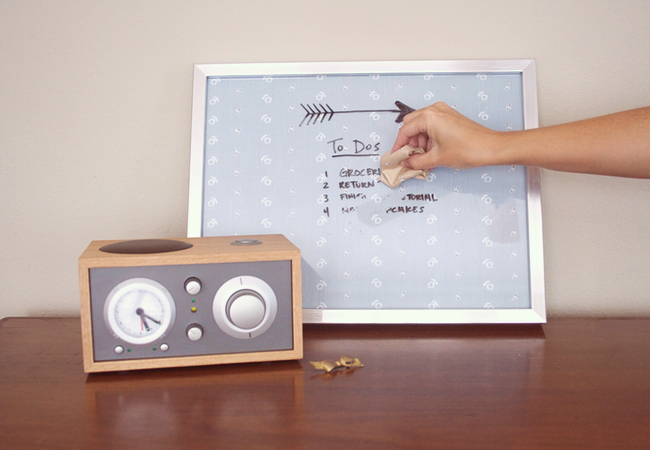 It doubles as art and a dry erase board. I'm definitely making one of these for my apartment in the fall. For complete instructions (plus more photos) head on over to Paper n Stitch.